The inimitable cartoonist Matt in the Daily Telegraph yesterday morning warned us to brace ourselves for what is to come: 'Only 46 government disasters to Christmas'. On the 46th day of Christmas, to cheer us all up in the grey November, the UK Government brought us the spectacle of the Secretary of State for International Development, Priti Patel, being forced to return from an official visit to Uganda before she had even arrived there. She had to get off the plane in Kenya and take the next flight back in order to be sacked (we were told) by Theresa May. In scenes reminiscent of O.J. Simpsons's 30 mph police chase in the white Bronco, Ms Patel's return plane was tracked live across the skies back to the UK for eight hours or so – hours and hours of 'breaking news', then as now. On arrival a motorcade tracked by a news helicopter took her to Downing Street to meet a waiting Prime Minister, who was so angry with her that she… er, accepted her resignation. Whenever the camera caught her, Ms Patel was beaming delightedly. The media commentators must have thought that Christmas had come 46 days early for them this year. Governments often survive sleaze scandals, recessions and even the most disastrous of wars. Few, if any, ever recover when they become laughing stocks, objects of pity and ridicule. That, tragically, is the direction in which Theresa May’s rudderless Government is fast heading: at one point more than 22,000 people were tracking Priti Patel’s Kenya Airways flight back to Heathrow. The scenes when she landed were even more farcical, and proof that Downing Street can no longer operate in a dignified manner. Why on earth didn’t anybody see that it wasn't in the PM's interests for this sorry saga to dominate the entire day in Westminster? If she really wanted to sack Patel, the Secretary of State for International Development, why didn’t she do it quickly over the phone, and seek to regain control of the news agenda? If a Minister travels abroad and wants to meet senior representatives of a foreign government it is normal to advise the Foreign Office and to study any brief they send so that the Minister sticks to the government view of the issues that relate to the UK’s relationship with that country. If a Minister goes abroad for a holiday or to visit friends and family there is not usually any need to consult the Foreign Office or to understand the government line on all the issues, as the Minister is not speaking as a Minister or becoming involved in public policy. If a Minister goes to a foreign country to participate only in a conference or series of meetings that are clearly party political, again they cannot use government assistance and do not have to tell officials. Various officials in Whitehall clearly do not like Priti Patel for whatever reason. They started briefing against her, claiming she had held meetings when on holiday in Israel that should have been reported to the Foreign Office, and cleared in advance of holding them. The Prime Minister was brought in to adjudicate. According to the press she asked for a full statement of what Priti Patel had done on holiday and told her she should not freelance in this way. When it subsequently emerged that the Minister had not made a full statement of what she had done, the Prime Minister clearly decided to take further action. It is ultimately for the PM's judgement whether any given meeting or event was a political or an official one, and whether any given Minister has stepped too far from government policy in what they have said and done. It is clearly best if Ministers can work well with their officials, or can at least trust the official machine with details of their activities. It can also be the case that sometimes officials have their own reasons for wanting to criticise their Minister through unofficial and anonymous briefings, or by report to the Prime Minister. Only the Prime Minister can ultimately decide the merit of these criticisms. Establishing control when something has gone wrong is not easy. Some say sacking the Minister gives the PM control, but it also gives a win to the officials who wanted the Minister out. Theresa May's wax figure is seen on the Madame Tussauds London Downing Street set. Image: ©Madame Tussauds 2017. There is only one quick solution to the Government's problems. 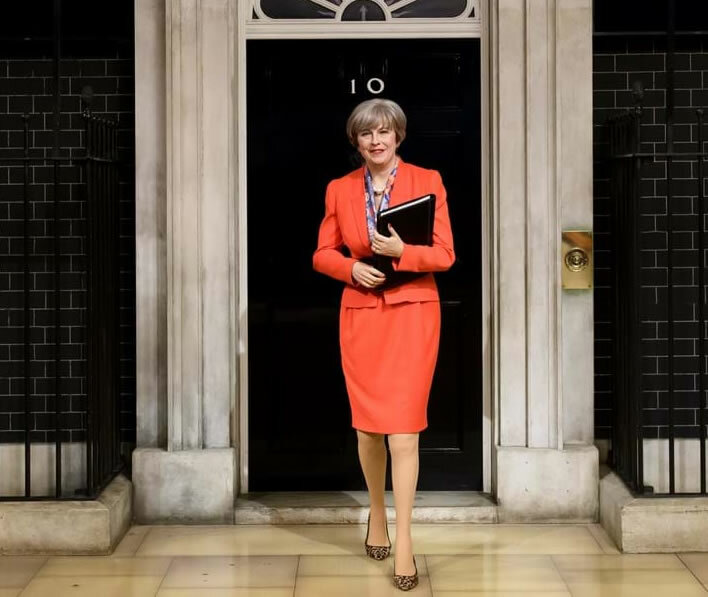 Mrs May must be replaced immediately with her spanking new maybot replica from Madame Tussauds Waxworks, which has the advantage that it says nothing, does not attempt to think and the replacement will not provoke a leadership election. It cannot do any worse than the life model. 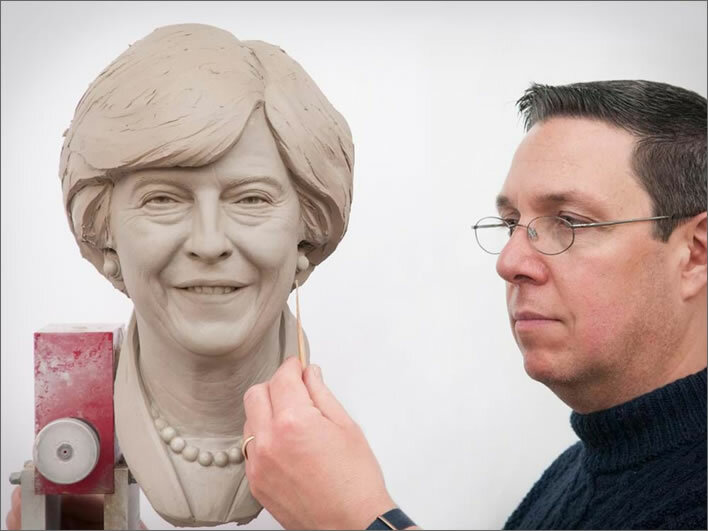 Principal Sculptor Stephen Mansfield with the finished clay head of Theresa May's wax figure. Image: ©Madame Tussauds 2017. 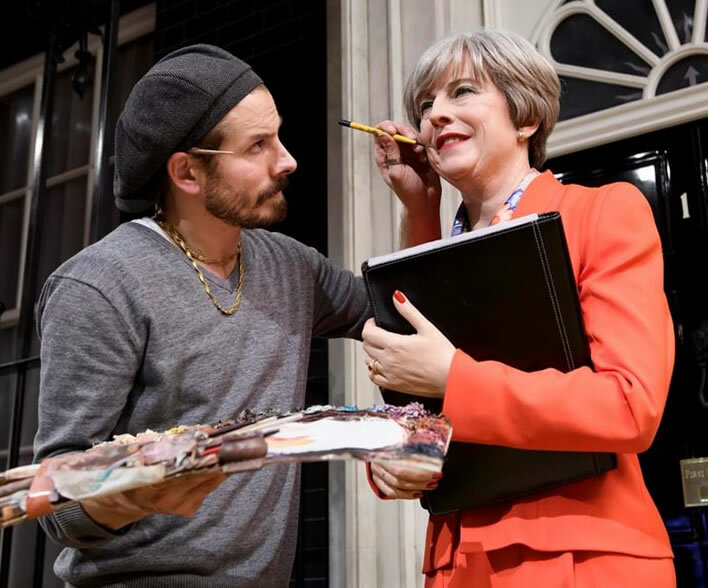 Studios Artist Chris Garguilo adds the finishing touches to the Theresa May wax figure. Image: ©Madame Tussauds 2017.